You can eat shelled almonds without soaking them, but many people allow them to rest in a bowl of water overnight to enhance the flavor. Some even believe soaking almonds makes them easier to digest. For example, soaking almonds might leach enzyme inhibitors, such as tannic acid, from almonds, thereby promoting better digestion, according to chef Renee Loux's book, "The Balanced Plate." After the almonds soak, the skins should be soft enough to slough off after a gentle squeeze, though you can leave them on if you enjoy their taste. Place almonds in a deep bowl. Pour in about 2 cups of water for every 1 cup of almonds. Use filtered or bottled water to ensure the flavor of the almonds isn't masked. Add more water if the almonds aren't completely covered. Leave on a counter overnight, or about 6 to 12 hours. 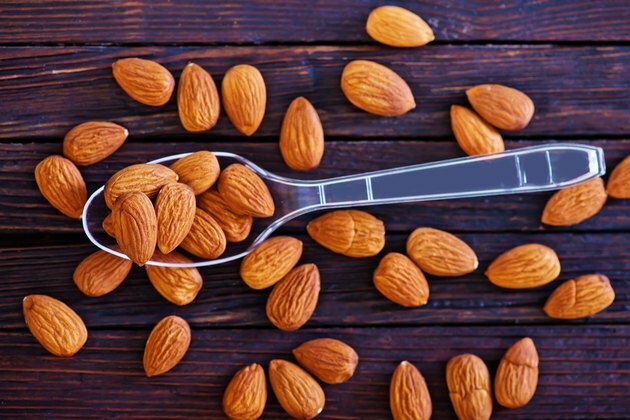 You can eat the almonds immediately, pop them out of their skins or store them in an airtight container in your refrigerator.